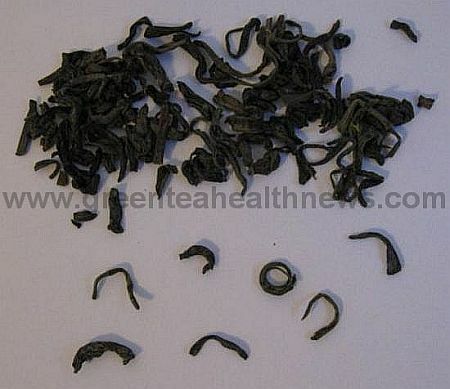 Eyebrow teas are a group of green teas unique for the shape of the processed dry tea leaf. After steaming and withering, each leaf or leaf-bud set is hand-rolled into a tiny needle-like shape with a slight curve or curl in it. The finished leaf should be as small and narrow as the eyebrows drawn on the face of a porcelain doll. Chun Mee tea is the most popular eyebrow variety. It is the daily green tea choice for most of China and has been a favorite for 400 years. "Tea's a good drink. It'll keep you going." Judi Dench to Kevin Spacey in "The Shipping News"
Try Chun Mee tea for those times when you need a refreshing moment during your day. What do the Chun Mee teas look like? Leaf: The leaves are a fine medium jade color. Each dried leaf is about 1/4 to 1/2 inch long, but appears very thin. An important quality is the consistent shape--small and curved--like the eyebrows painted on a porcelain doll. Brew: The liquor is a clear mellow yellow in the cup. There is a lingering sweet fragrance with this tea. This Chinese green tea is full-bodied, but the slight astringency helps clear and clean the mouth. While you may occasionally find one with smoky or toasty notes, the hallmark of this variety is the provocative plum-like aftertaste. It is versatile and has a great taste for your daily tea. The dried leaves have a sweet aroma, reminiscent of plums. When to serve Chun Mee? You can drink it daily, of course, as they do in China. It works wonderfully for summer feasts that serve barbecue and lots of vegetables. Chun Mee tea is unusual among the green teas because it can easily accompany strongly flavored foods. The slightly astringent quality helps clean the palate and refresh your tastebuds. You can serve it with cheeses like Gorgonzola and Camembert. Barbecued chicken and pork, as well as spicy mustard meats also work well together. Like all Chinese green teas, you can serve it with fish and seafood, including chowders. It can also be served with vegetarian dishes and quiches. Plum desserts are enhanced when served with a higher grade of this tea. Use about one teaspoon of leaf per cup. Make sure you use freshly heated water rather than previously boiled water to avoid a flat taste. The temperature should be just before the boil or 180F/80C. Steep for three to four minutes. You don't have to change the leaves, just add more hot water for up to three infusions depending on the quality of your selection. As usual, no milk or sugar is used with this green tea. According to the Anhui Province Board, the direct ancestor of these teas is the Anhui green tea from the Ming Dynasty in the 1600's. As the hand-processing for the eyebrow shape became perfected, this high quality tea swept through all China to become the favorite drink. It is still the most popular green variety in China. What is the best grade? The finished leaves of a high grade Chun Mee tea are very consistent in size and shape. Any of the eyebrow teas picked "Yu-tsien" or before the rains are considered higher quality and will make a liquor that is smoother, more complex, and more fragrant. It is grown and processed throughout Anhui Province, Jiang Xi Province, Zhejiang Province, Yunnan Province, and other provinces throughout southeast China. The leaves are first steamed, then pan-fired to dry them. During this time, each leaf is hand rolled, using movements that require great hand coordination, temperature coordination, timing, and patience. It is also called Chun Mei, Zhen Mei, Mee Cha, and Precious Eyebrows. There are white teas that are also called Mei or eyebrow teas because of their shape. Sometimes you will see eyebrow teas labeled as Hyson or Young Hyson. This is a common name, like Bohea, that has been used for many teas, including the early pearl teas, later named gunpowder.